This is a wild and sublime photograph taken on a hike along the trail up to Vernal Falls in Yosemite National Park, California. 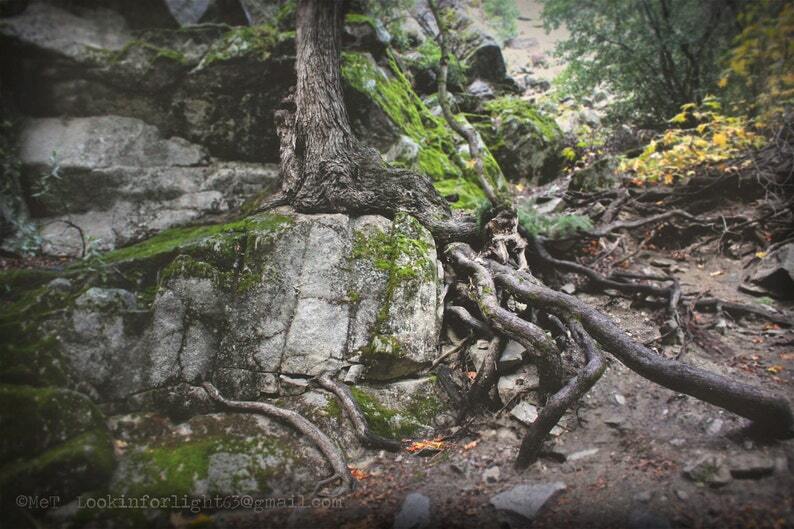 Details: The beautiful writhing tree roots grow along the path and intertwine within the cracks in the massive boulders. Rich contrast of woodland textures and colors. Original Open edition photograph custom-printed on Premium fine art photo paper with archival inks. The work will ship WITHOUT the Copyright stamp through the image. There is a very small semi-transparent artist watermark in lower corner. The photograph I purchased is even lovelier in person. So evocative. I’ll be framing it as a gift but am tempted to keep it myself. Excellent, courteous service & item well packed. Gorgeous photo of an amazing place. I love how the light was captured because it reminds me of our trip there a few years ago. Credit cards, debit cards, Etsy Gift Cards, check or money orders accepted. For checks, order will be processed when cleared. All work is guaranteed. Money is refundable less shipping to and from buyer. Please note, custom created works are not refundable. I will provide proofs for your approval before completing final transaction. Due to the nature of Instant digital downloads they are not refundable once the file has been downloaded. Please Note FREE SHIPPING offers do not apply to mounted metal or canvas works unless otherwise stated. Work will be shipped via USPS in a sturdy, protective tube or rigid envelope or box. Please email me with specific shipping needs regarding rush service or need for signature. Canvas Photos will be shipped with protective packing in a sturdy box. All photos are printed on Premium quality fine art photo paper with archival inks to resist fading to last a lifetime in typical indoor display. It is best to avoid displaying photos in direct sunlight over long periods. ***If you have a preference please add your request into the notes section, otherwise I determine which finish is appropriate for each image depending color/contrast and tonal range. Please note color may vary slightly due to differences in monitor calibration. Prints may appear slightly darker due to monitor illumination. Please Note FREE SHIPPING offers do not apply to mounted metal or canvas works unless otherwise noted. All work is original. My photographs are copyrighted and protected by law. Please do not reproduce without permission. Please email for licensing for commercial use/resale.